In addition to attaching his name to everything under the sun, Donald Healey also built cars on his own. Between 1946 and 1954 the Donald Healey Motor Company churned out seven models of their own design that weren’t associated with Nash, Jensen, or Austin. The Abbott was one of the last models to be introduced, going on sale in 1950. The name came from E.D. Abbott Ltd, a Surrey-based coachbuilder that actually built the body for this car (which is quite attractive compared to some of their other cars). All models were Drophead Coupes, and this particular car is powered by a 2.4-liter Riley twin-cam straight-four. Production wrapped in 1954, with just 77 units produced, putting it right in the middle when it comes to Healey rarity. Only 20 are thought to remain roadworthy. This well-restored and well-used example should bring between $58,000-$71,000. Click here for more info and here for more from Bonhams. 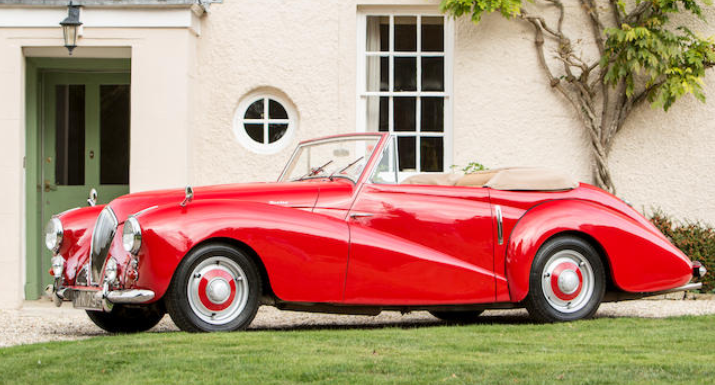 This entry was posted in Uncategorized and tagged 1953, abbott, auctions, Bonhams, cars, classic cars, drophead coupe, healey by classiccarweekly. Bookmark the permalink.